Sukhbir Singh Badal, Deputy CM Punjab shaking hands with Mr. N.R. Narayana Murthy, Chairman of Infosys after laying foundation stone of Infosys Campus at IT City Mohali on February 22, 2014. Sukhbir Singh Badal, Deputy Chief Minister, Punjab today set the stage for information technology revolution in Punjab by laying foundation stone of IT giant Infosys Campus at IT City Mohali and said it would change the economics of Punjab besides creating more than 20,000 job opportunities.Describing today a historic day for Punjab in the presence of Mr. N.R. Narayana Murthy, Founder and Executive Chairman of Infosys, Mr. Badal thanked the Infosys, a global leader in IT technology and solutions, to set up its big ever IT Campus here, which will be a ‘feeder’ to IT related industries by catering the needs of entire north India leaving big impact on employment generation. “It was my long pending dream to bring IT revolution in Punjab by making it most favoured IT destination of the country and we can realize it today with the landing of Infosys to Punjab” said he adding we have achieved our target to have Infosys Campus in the state only within 100 days of meeting with Mr. Murthy at Bengaluru. “It was just because the positive approach of Punjab Government and fastest delivery of approvals and permissions for setting up of new industrial units” said Mr Badal. Deputy CM said that besides Infosys 26 IT companies have already been given the land allotment letters to setting up of their units in IT City premises. Adding further he said Mohali would be the top IT destination in the country after Bengaluru, Hyderabad and Gurgaon since high living cost and congestion in these cities as Mohali will be the best option in present IT scenario. He said IT City Mohali was just 5 kilometer away from Mohali Airport, half an hour far from Educity and Medicity being setup in well planned New Chandigarh. The Deputy CM said in view of IT era, the Punjab Government has implemented e-district project to enable the citizens to get their required services at their doorsteps on a single click on computer and in coming one year Punjab would be the first state to have paperless working in all government offices. He said this first Infosys campus in Punjab at SAS Nagar would be spread over 50 acres of land and would generate more than 20000 job opportunities. In his address Mr. Murthy lauded the industry friendly approach of Punjab Government and said state has done a commendable job in developing Mohali as an investment destination with its new industrial policy and world class infrastructure. 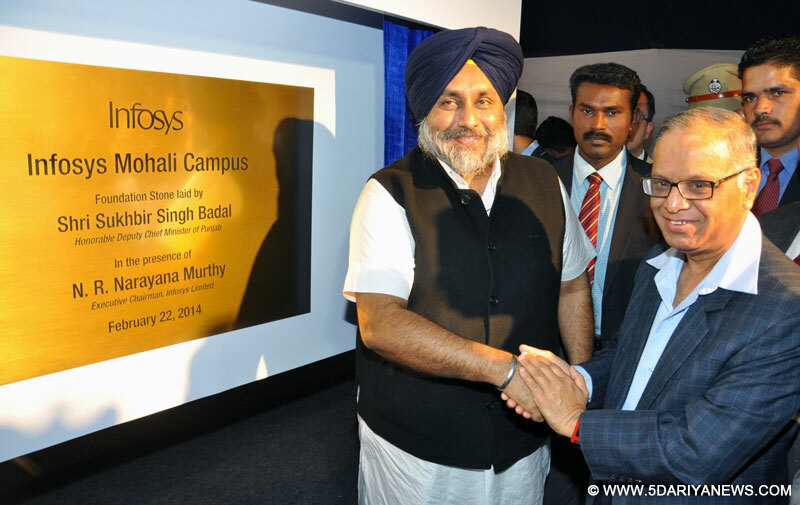 He said Infosys was grateful to dynamic and visionary Punjab CM Mr. Parkash Singh Badal and Deputy CM Mr. Sukhbir Singh Badal for extending all cooperation and support to establish Infosys at IT City Mohali. He said in the first phase Infosys would make an investment of Rs. 425 crore to create a built-up area of 6.5 lakh sq. feet to seat 5,000 software professionals within 24 months.Prominent amongst others present on the occasion included Rakesh Singh Chief Secretary, Karan Avtar Singh, Principal Secretary Industries, C.Roul, Principal Secretary Governance Reforms, A. Venu Prasad, Secretary Housing, Anirudh Tiwari, Secretary Power and CEO PBIP, Vikas Partap, Director Industries, Manvesh Singh Sidhu, Ajay Mahajan both Special Principal Secretaries to Deputy CM and Jangveer Singh Media Advisor to Deputy CM.